IJL unique coverage provides practical advice on key business-law issues such as regulatory compliance, IP protection, taxation, dispute resolution, competition law and much more. It assesses the implications of legal developments, ensuring that our readers are kept fully informed of the threats and opportunities that arise from every significant change in the law. It also provides vital intelligence on the country’s law firms, legal process outsources and judiciary. IJL started with an aim to provide an avenue for the expression of views of people belonging to the field of law. It is open for all to submit and subscribe the journal. 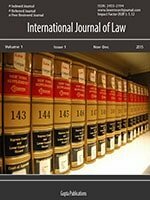 In the present globalized scenario, it is necessary for people belonging to other fields to understand the importance, impact, and the image of law as it can affect the public at large when taken as a whole and group of individuals when viewed in parts. Further, knowledge of law (at least to an extent) has elevated form being a matter of passing interest to a level of general aptitude. 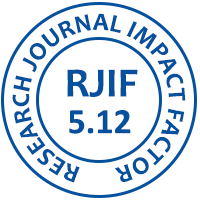 The uniqueness ofIJL is that, it operates without any theme, so as to provide a reasonable opportunity to those who interested in the field to express their views accordingly. IJL aims to facilitate the students, teachers and scholars to write papers on various contemporary issues and current trends in law. 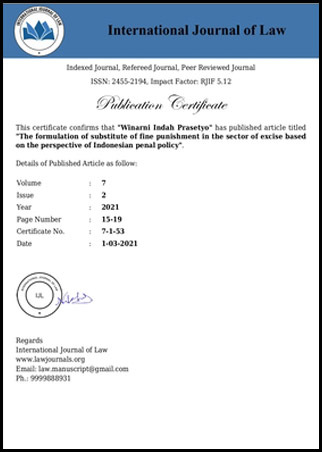 IJL invites Articles, Short Notes, Book Reviews and Case Commentaries from the legal fraternity of the country for the forthcoming issue. IJL provides a forum for the exchange of ideas and constructive debate on legal and policy issues surrounding world trade, cross-border investment, environment, and development, broadly defined.